Fromagio Bamboo and Slate Cheese Board and set. 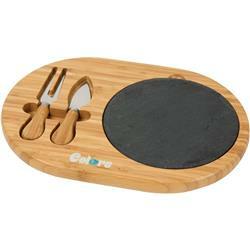 Set features a removable Slate cutting board, while the Bamboo tray stores two Bamboo handled cheese utensils. Made out of FDA compliant materials. A great holiday gift that will be used for years to come! All with your custom logo.